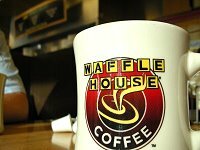 Home » Atlanta REIA Blog » Articles » Wow – Does Waffle House Serve Strawberry Mocha? Here’s an interesting question for the real estate investors out there: When a seller or realtor calls you about a property for sale, what’s the MOST important thing you need to see? If you’re like most investors, your answer is: the neighborhood; or, the condition of the home; or, the number of bedrooms, etc. But those answers are wrong. The correct answer is: The Seller!!!! Remember, the only person who can fully answer Pete Fortunato’s famous question: “Why are you selling such a nice house like this?” is the seller. One more important point: Since 90% of human communication is NON-verbal, if you want to fully understand the seller’s situation, you must get eyeball-to-eyeball with him and ask a lot of “Tell me what’s going on?” questions. I’ve learned that WHAT a seller says is not nearly as important as HOW he says it! To get the deal, the key is to help a seller improve his uncomfortable situation. The only way you can structure a deal that improves the seller’s uncomfortable situation is to first FULLY understand his situation. And again, that’s done face-to-face, eyeball-to-eyeball. When structuring a deal, it’s critical to be, as my friend Jean Kramb says, rubber-band flexible. Too many investors only have one deal-structuring tool in their deal-structuring toolbox – a big dang hammer! If you don’t know how to creatively structure win-win deals, you’re likely to be nothing more than a bug in search of a windshield – SPLAT! Turned out, my solutions were confusing the seller. This reminded me of something Jack Miller (God rest his wise soul) said: “A confused mind always says, NO!” After better explaining my offer – and explaining what’s in it for him and me – he finally accepted. Later, while discussing my deal structure with my buddy Houston Long, he said, “Talking to a seller over coffee is a great idea. I didn’t know Waffle House served Strawberry Mocha.” Lord, does anyone drink black coffee any more?